Ing "Satchmo" lilipat ya keni. Para keng the online store system, lawen ye ing Satchmo (online store). 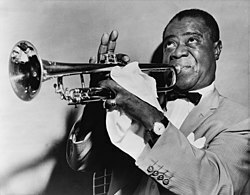 I Louis I Daniel Armstrong (Agostu 4, 1901 – Juliu 6, 1971), palayo Satchmo o Pops, metung yang Americanung jazz tuturutut (trumpeter) ampong talakanta ibat New Orleans, Louisiana. ↑ Mas buri neng mayayagkas ing kayang lagiu bilang Louie. 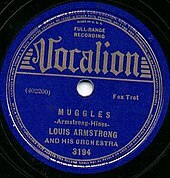 "Balamu Louis Armstrong - dapot ing kayang kulitan Louis, dapot buri neng masasabing Louie", atatandanan nang Louie Bellson . Ing Armstrong makarehistru yang "Lewie" para keng 1920 U.S. Census. Kareng dakal a pialben na ya mismu ing lalageng mabie mayayaus yang "Louie" keng entabladu, kalupa na inyang 1952 "Atin kekayung Makapalino? (Can Anyone Explain)?" king kayang mabieng album In Scandinavia vol.1. Metung mu naman tandanan na ing "Lewie" iya ing French a pamanagkas keng "Louis" at pangkaraniwan yang magagamit king Louisiana. kaibat ning kayang kamatayan, ding keraklan ing kayang agkas a lagiu bagia bagia meging yang "Louis". ↑ Armstrong said he was not sure exactly when he was born, but celebrated his birthday on July 4. He usually gave the year as 1900 when speaking in public (although he used 1901 on his Social Security and other papers filed with the government). Using Roman Catholic Church documents from when his grandmother took him to be baptized, New Orleans music researcher Tad Jones established Armstrong’s actual date of birth as August 4, 1901. With various other collaborative evidence, this date is now accepted by Armstrong scholars. See also age fabrication. "Louis Armstrong Transcription Project - john p birchall"
Louis Armstrong: discography and early recordings (Real Player format): on the Red Hot Jazz website. LUGAL KEBAITAN New Orleans, Louisiana, U.S.
LUGAL KEMATIAN New York City, New York, U.S.
Tauli yang miyalilan ining bulung anyang 09:07, 9 Marsu 2013.